Each content item in a Plumi site can be easily shared via social media (eg: Facebook, Digg, etc). At the top right hand corner of each item can be found the Share This icon. When you click on this icon, it will expand into a list of icons for the various social media sites, allowing you to click on the site you want at which point the site will open and you can start entering information about the item you want to share. Every user of a Plumi site has a workspace called my folder. Inside this folder, you can add not only videos, news, events and callouts, but also other content such as pages, folders, images, or links. As an example, here is how to add a page. Click my folder to visit your workspace. Click the add new... drop-down menu, and click page. Give your page a title, description and body text, and click Save. Plumi can be used as a shared space to collaborate on content. Sharing gives others permission to do certain things with content you have created - such as viewing or editing. Others can share their content with you too, giving you certain permissions. 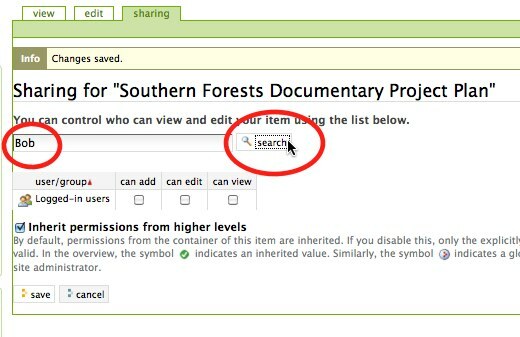 This sharing function allows you to collaboratively author content with other Members of the site. There are many different circumstances in which you could use the workspace and share content with others. As an example, we will use the case that you could add a page, share that page with others, and use that page to collaboratively edit a script or project plan for a movie. Navigate to an existing item you have already created (in this example we will use the page we just added). Click the sharing tab. Enter the username of the Member you wish to share this page with (in this case, Bob) into the searchbox and click search. 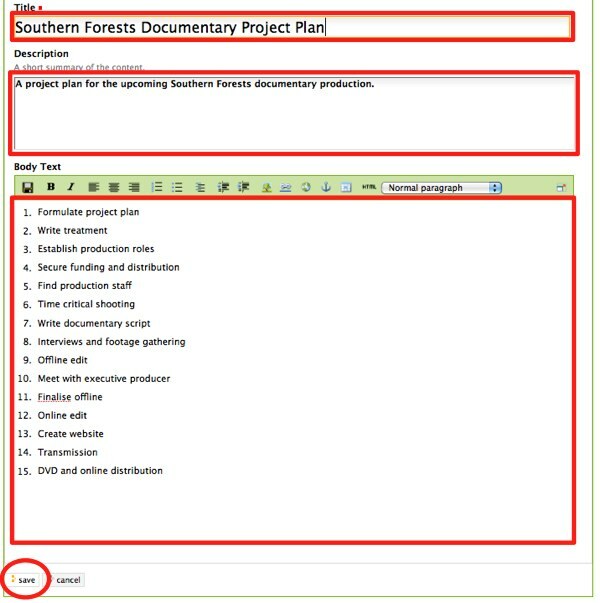 Click the can edit and can view checkboxes and click the save button. 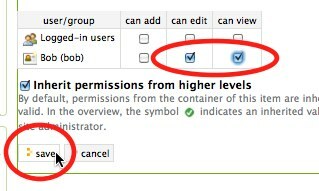 The user Bob can now view and edit this page, enabling both of you to collaborate on it.